Despite intensive efforts by banks to convert their internet banking clients to paperless statements, adoption statistics remain below 15%. In this month’s edition of eBilling Insight, we explore the reasons for this slow uptake of paperless adoption and outline what banks can do to turn off paper. Today, consumers are downloading electronic versions of their statements easily and quickly via internet banking. Therefore, the burning question is: if this easy option exists, why do more than 80% of US consumers still receive paper statements? The answer – there is simply no incentive or compelling reason for them not to. Every major bank has tried in vain to compel, entice and incentivize their customers to give up paper. Customer “paperless incentives” (a once-off incentive paid to the customer on turning off paper) is not a financially viable solution, as it is an immediate hit to the bottom line. The current average hard cost (printing, envelope, postage) of mailing one paper bank statement is approximately US $0.50. If a bank were to offer a $10 incentive per customer and achieve a higher than market average turn-off of 20%, by including marketing costs, a customer would need to be paperless for 24 months for the bank to break even. Statistics indicate that across North America and Europe, 75% of internet users are below the age of 55, of which 90% have home broadband access. In consideration of these facts, the answer must lie in the customer experience. It’s an effort: The consumer has to act in order to turn off the paper. In most cases, the action required is a multi-step website navigation process – find the correct webpage within internet banking, navigate through very intimidating legal language and check multiple boxes .To date most banks are reporting a low conversion to paperless statements, with a rate of only 5% to 10%. Keeping records: Consumers have been educated to safely file their bank statements. Although banks are increasingly offering multi-year archives, most consumers find it simpler to continue filing them away when they arrive by post. 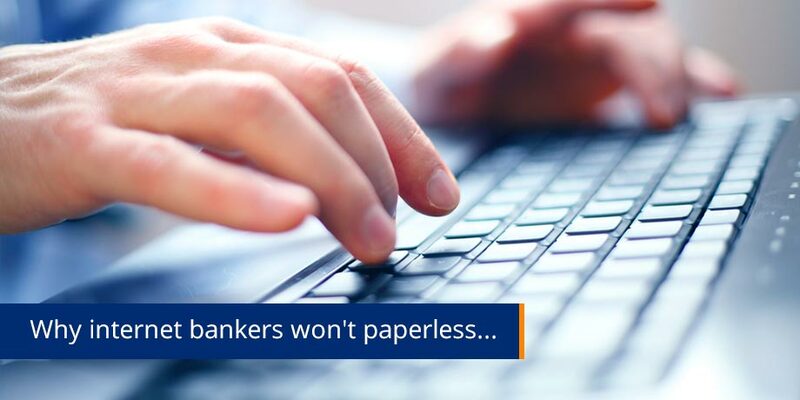 Therefore, unless financial institutions change their current paperless strategies dramatically, the number of consumers who will opt for electronic statements only, will plateau at less than 20% of their internet banking clients. Even this will take another 3 years of aggressive promotion. How do banks address this? Today, at least 3 of the top 10 major banking brands around the world, that have implemented email billing as part of their paperless strategies, are experiencing a surge in paper turn off. Eliminates the registration process: Adoption planning has enabled the banks to transition their customers to paperless statements though intelligent marketing. Guarantees convenience: Going paperless is more convenient than not if the consumer finds it takes them less time to open an eStatement rather than the paper alternative. Utilizes email delivery: Recognized as the most widely accepted form of communication, the eStatement can be read with just a single click. Security and storage: Fully sender authenticated, the emailed statement is more secure than paper and remains encrypted while not in use. It can easily be stored for future reference. Targets 100% of client base: email statements can be targeted at all customers rather than just those that utilize internet banking. In conclusion – until financial institutions adopt secure electronic document delivery, paper statement suppression will remain an elusive goal.